ABBA: Bang a Boomerang tells the story of how Australia fell in love with the Swedish supergroup. Viewers were going into record shops wanting to buy the single. Molly rang RCA records asking about the release of Mamma Mia and was told there were no plans to do so. “We then played it again in defiance and they had no option but to release it… it was lucky, it went to number one” Meldrum continues. ABBA: Bang a Boomerang digs deep into heartfelt memories, cardboard cartons of memorabilia, face‐to‐face encounters, local pop icon recounts, lavish personal and public ABBA museums and Australia’s rich media archives to relive a moment of collective national ‘craziness’, when we did literally go ABBA mad. The result is a warm, bright, captivating engagement with ABBA‘s time Down Under that will remind us all of the band’s impact and how our open‐hearted embrace of all things ABBA would eventually define us. One in three Australian households owned an ABBA record – from Prime Minister Fraser to eight‐year‐olds around the nation, we were hooked even if some of us didn’t want to admit it back then and we didn’t realise the crush would be for keeps. The program also speaks to Australian fans whose devotion has never wavered, including entertainment professionals such as John Paul Young, Daryl Somers, Julia Zemiro and Libbi Gorr; founder of the Australian ABBA Fan Club Graeme Read; and music critics such as RAM’s Anthony O’Grady and music journalist Barry Divola, who both now concede the genius behind these perfectly crafted pop songs. Australians related to ABBA’s innocence and vitality, which somehow resonated with us more than any other music before it. Later it took Australian tribute band Björn Again and two Australian movies, Muriel’s Wedding and Priscilla Queen of the Desert, to bring ABBA back from an 80s’ wilderness and return them to centre‐stage worldwide – where their music, old and new, remains today. ABBA: Bang a Boomerang tells the inside story of ABBA’s success in Australia, how it reverberated into world stardom and the birth of a supergroup. “I never admitted I liked ABBA because I thought, ‘They’ll think I’m gay’. “I was ecstatic. I went across to the Sebel Townhouse in my school uniform and they pulled me aside and said, ‘We want to take a photo of you and Frida and Agnetha.’ And so there’s the photograph of me being hugged by both of them, which is an enviable position to be in. It was like Sunday roast, you know. ABBAWORLD The Official Interactive Exhibition was declared open last night by none other than Agnetha and Benny, by video from Stockholm. See their video greeting here. Members of the Official International ABBA Fan Club were treated to a special preview on Wednesday night, with the official gala opening on Thursday night. Everyone at both events seemed to really enjoy the experience, taking part in the interactive activities and marvelling at the memorabilia on display. In a nod to the location there is a selection of original Australian ABBA merchandise from 1976 and 1977, and a board of stories from Australian ABBA fans. Also in a special coup Australian writer Christopher Patrick’s book Let The Music Speak – an armchair guide to the musical soundscape of the Swedish supergroup is on sale in the gift shop, the only book aside from Björn Ulvaues’s The Little White Piano authorised for sale at ABBAWORLD by the ABBA members themselves. But if you can’t get to ABBAWORLD to buy it you can order it from Christopher’s website. ABBAWORLD opens to the public at Federation Square, Melbourne on Saturday June 19th. The exhibition is schedule to run until October 31 2010. See a report on the opening here. Go to the ABBAWORLD website for more information. 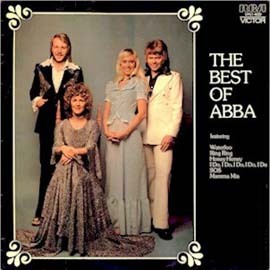 ABBA – The Movie is the tenth-highest grossing Australian-made documentary film of all time in Australia, and the 110th highest-grossing documentary film overall. Ten years ago today, my very first ABBA website, The ABBA Phemomenon in Australia, went online. Way back in early 1997, there were already quite a few ABBA fan sites. Most were fairly generic, with basic biographies and standard discographies. But there was a gap about ABBA’s unique success in Australia that I had lived through. Inspired by a 1995 article on ABBA’s Australian dicography in a local record collector’s magazine that had included many mistakes, I had already compiled the full ABBA discography, which continued what I’d already been collecting since 1976. I had an idea that it could be the starting point for a book about ABBA’s Australian experience. Then the internet came along and that seemed the perfect outlet for the information I’d gathered so far. The site has come a long way since July 19th, 1997. It started out as the basic Australian discography with just a few pages, but has grown to include memorabilia, ABBA’s visits to Australia in 1976 and 1977, ABBA – The Movie (filmed on the Australian tour in 1977), the commercials for National electronic products that ABBA made for Australia, and much more. It’s continued to be updated right through to today. It’s also moved around the net until its current home today as a sub-site of ABBA World – ironic really, as ABBA World’s predecessor, ABBALINK, started out as an offshoot of The ABBA Phenomenon. I’m pleased that my site had served its purpose in explaining this significant era of ABBA history. As well as being visited by fans across the globe, it’s been used as reference material for several ABBA books, television documentaries and the media at large. To commemorate the 10th anniversary, I’ve resurrected a concept that I started several years ago but never really got off the ground – The Archive, featuring classic articles from newspapers and magazines. Thanks to my friend Samuel Inglles, The Archive now includes lots and lots of articles from the height of Australian ABBAMANIA in 1976 and 1977, with still more to come. Viewers of ABBA – The Movie will have seen one of these flags fluttering in the evening breeze at the start of ‘Fernando’. The flags bearing the ABBA logo in blue, green, yellow and red letters decorated the various concert venues during ABBA’s Australian tour in March 1977. I remember a row of them flying from flagpoles atop on of the stands behind the stage during that legendary first concert in Sydney on March 3rd. They can be seen adorning the Perth Entertainment Centre in The Movie (the round building Ashley runs into not long after arriving in Perth). And the one seen in close up was probably filmed in Melbourne. The flags themselves were manufactured by AB Industri-Reklam in Stockholm, Sweden. So it’s surprising that there’s no recollection of the flags flying at European concert venues that year. 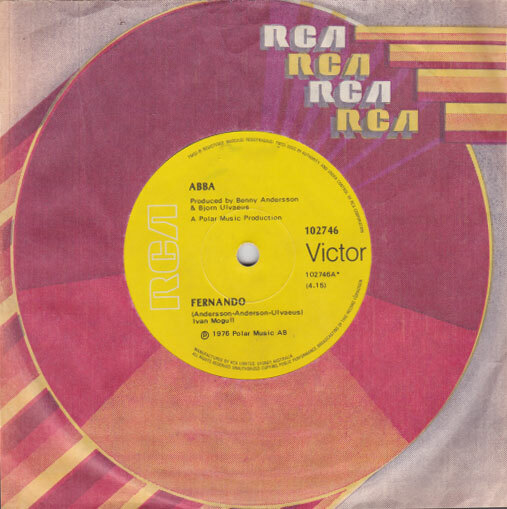 The colours of the letters are probably a simplified version of the “rainbow” ABBA logo that appeared on the European tour programme and on the recent authorised biography Fenemonet ABBA (aka The ABBA Phenomenon and ABBA By ABBA), and later featured on the ABBA Annuals (1978 to 1983) and 1994’s ABBA – The Complete Recording Sessions by Carl Magnus Palm. How many of these flags were made or how many still exist is anyone’s guess. There were almost certainly several dozen on display in 1977. I’ve encountered three of them over the past twenty years – one hanging on the front wall of a house in Cleveland Street, Sydney in 1987; one in the hands of PolyGram Records in Sydney around 1992; and the one pictured here, that was offered for sale about ten years ago on the various ABBA mailing lists at the time, long before eBay came into our lives. I was hoping to buy it at the time, but it just didn’t work out. I recently heard from the successful buyer of the third one, who assures me that it’s in safe hands and being well looked after. Many fans yearn for a particular rare ABBA record or merchandise, such as the ABBA dolls. This is my “holy grail”.